I purchased this lampshade years ago on sale at Target and it's been in the livingroom, familyroom, bedroom and office in three houses. 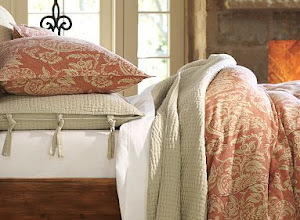 Now it's moving again to the side of the spare bed, next to a new West Elm comforter purchased on sale and on impulse. One yard of grey houndstooth fabric popped out during my recent frenzied trip to Jo-Ann Fabric. 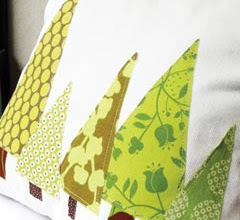 Since there's no reason to reinvent the wheel, visit Fat Orange Cat to learn step-by-step how to cut out fabric for your odd shaped lampshade, and I suggest you leave a little edge if you decide to take the fabric around the edges. It worked for me. To secure the fabric along the inside, I used hot glue and a few toothpicks to avoid burned fingers - I suggest you do the same if you're taking the hot glue route! The houndstooth is great in this room and I'm excited to move along with this combination. Too bad I didn't get this done before The Whole EnCHELLEada left California ....! Everything is in your honor!